The DoughXpress manual pizza dough press is the efficient, economical, and durable way to press dough with consistent results and speed. Discover the quick, safe way to flatten pizza dough without the need for flour, additional equipment or even skilled labor with this manual pizza dough press! The heated upper platen of this manual pizza dough press helps flatten the dough faster and easier. It can also be used without heat for cold pressing. The digital temperature control displays the current reading and the digital timer begins automatically when the handle is lowered and resets after the handle is raised. 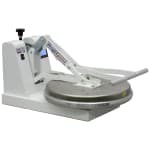 The full range dough thickness can be adjusted up to 7/8". An illuminated on and off switch is featured as well as a heat indicating light that turns off when the set temperature is reached. You can easily flatten dough balls into pizzas up to 18" in diameter. This heated manual dough press comes features a white appliance finish for a professional looking and easy to clean surface. Economy Pizza Dough Press, manual, up to 18" dia., uncoated aluminum platens, heated upper platen, digital temperature control to 200F, digital timer, infinite range thickness adjustment up to 7/8", pull down handle, on/off switch, appliance white finish, ETL Sanitation & ETL listed, Contact customer service for Xylan coating option pricing.